With your paid subscription, you will receive your choice of one case (20 books) of either of the titles described below. Free shipping is included with your books. Total value: $352.00. Only 1 out of 10 families successfully pass their unity and prosperity from one generation to the next. For as long as historical records have been kept, the three-generation cycle of boom to bust has been a painful circumstance felt by almost every family. Two thousand years ago in China the saying was ‘wealth never survives three generations.’ A century ago in Brazil it was ‘from the stables to the stars to the stables’ in three generations. Many cultures, one sad tradition of loss and failure. Watching your family’s material assets fade away is bad enough; even worse is witnessing the damage done to individual family member achievement and family unity, in large part because traditional inheritance planning fails to address the Midas Curse. Perry Cochell and Rod Zeeb knew why so many families were failing. For them, the more important question was: what were the 10% of families who continue to thrive and prosper generation after generation doing differently? Beating the Midas Curse is the product of decades of research and practical experience with hundreds of families at all income levels, from average income earners to billionaires. It details the practical, proven methods identified by Cochell and Zeeb that have been used for centuries by the ‘successful 10%’ to beat the Midas Curse. Start with the information in this book, and then begin your family’s own multi-generational journey to greater unity, strength and prosperity–right now. The 1st edition went through five hardcover printings, and has helped thousands of families. Read the new edition, and discover for yourself what you can do today to help your family thrive now, and for generations to come. The Bible is clear that we are to be good stewards within our families. For centuries that has almost always been interpreted as a mandate to first and foremost be wise stewards of our financial resources. Rod Zeeb's new book argues that if we regard the Bible's teachings on stewardship merely as a kind of spiritual money management program, we are missing the deeper value and far more encompassing gift that Biblical stewardship offers to families. Would you like to become a more effective steward of your own family, starting today? Would you like to help your children and grandchildren to unify and strengthen their own families in common purpose, and to remain strong and purposeful for generations? If so, Zeeb says, you must learn to move far beyond the money and focus on what the Bible teaches us is far more important than financial wealth. 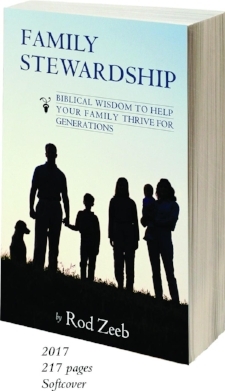 In this fast-paced, thought provoking book, Zeeb examines the importance of passing of the non-financial assets of the family and fulfilling the Biblical mandates regarding teaching and training our children and grandchildren. He draws upon Bible verse, historical scholarship, extensive surveys of studies about families, and his own two decades-plus career working with families who desire to build their futures upon the things that matter most to them, especially their faith. Select any article you wish, and we will create a special, holiday-themed version that includes a short personal message from you. Your clients and associates will appreciate your thoughtfulness, and they'll remember you when they recall the content of the article.